U.S. Department of Energy (DOE) Secretary Steven Chu contributed a statement to an announced breakthrough in research into tapping the vast fuel resource of methane hydrates that could eventually bolster already massive U.S. natural gas reserves. As Al Fin pointed out yesterday natural gas is priced to a barrel of oil equivalent at about $10-$11 per the estimable Geoffrey Styles view, something less than 10% of the cost of oil. For North Americans adding a viable and hopefully low cost means to make use of gas hydrates could be giant boost to low cost fuel sources and a massive kick to the economy. 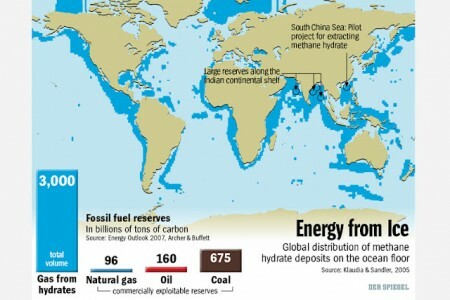 For experts the methane hydrates resource is the largest reserve of hydrocarbons in the planetary crust. So far humanity has not devised a process to economically harvest this immense energy wealth. Today’s DOE announcement may point the way to a new era in abundant energy to build out a bigger and better world economy. 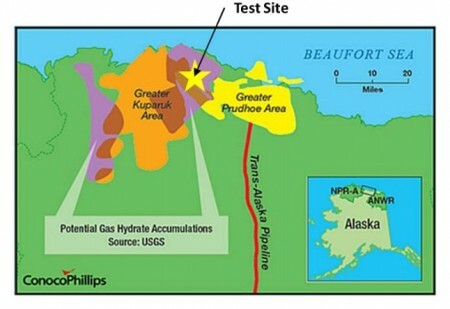 By injecting a mixture of carbon dioxide and nitrogen into a methane hydrate formation (pdf link) on Alaska’s North Slope, the DOE partnering with ConocoPhillips and Japan Oil, Gas and Metals National Corp was able to produce a steady flow of natural gas in the first field test of the new method. The test was done from mid-February to about mid-April this year. Methane Hydrate Test Site Map of US DOE, CononcoPhillips and JOGMNC Process Test. Click image for more info. Methane hydrates are cold ice crystal-like structures that contain methane the chemical of natural gas. The hydrates are located under the Arctic permafrost and in ocean sediments along the continental shelf and widely spread worldwide. 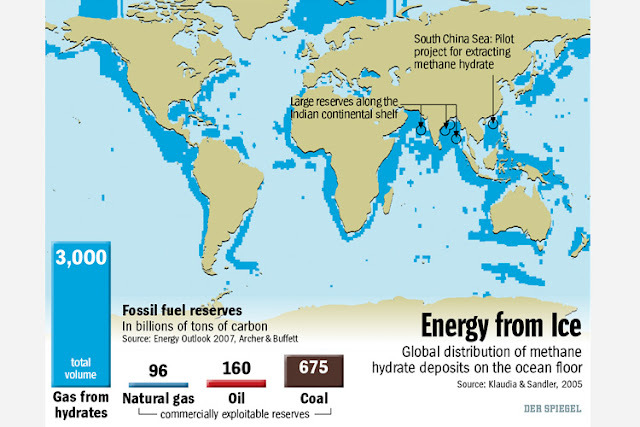 Methane Hydrate Resources per Der Spiegel. Click image for the largest view. Gerald Holder, dean of the engineering program at University of Pittsburgh, who has worked with the DOE’s National Energy Technology Laboratory on the hydrate issue, said before the announcement he had been skeptical about what researchers would be able to accomplish. He said the main problem until now was finding a way to extract natural gas from solid hydrates without adding a whole lot of steps that made the process too expensive, which makes the success of this new test significant. “It makes the possibility of recovering methane from hydrates much more likely. It’s a long way off, but this could have huge impact on availability of natural gas,” said Holder. While everyone is suggesting that methane hydrate production is some time in the future, we might note that a partner is from Japan, a country that has been buying via imports virtually all its energy and fuel inputs. A glance at the map of potential reserves shows that Japan may well pour on the intellectual and financial power to get results much quicker than many expect. On the other hand, for North Americans natural gas is ratcheting down to dirt cheap, with more resources with the new horizontal drilling and reserve fracturing available on land and significant amounts of natural gas at sea in already developed areas. For everyone the matter of coming up with the CO2 for the injection is going to be a significant issue. First just gathering it remains a significant problem. Making it from – natural gas – is the preferred method today. That raises the question if the CO2 injected is lost to sequestration or is it recycled for reuse, or what proportion is being lost or recycled? CO2 is very useful and it may become a valuable resource in its own right very soon. Abundance makes a lot of things that weren’t viable at a price possible at lower costs. Abundant fission or cold fusion could make electrolysis viable freeing hydrogen for adding to coal for both liquid fuels and CO2 sources. Scaling could make such concepts usual and common thinking very quickly. For now though the DOE and partner’s news is very gratifying. It must be giving the futurists at OPEC an OMG moment, again. Things are going to be changing. Lets hope the DOE and the partners spill some more info soon so we can have a better look. Since they are injecting Carbon Dioxide into the earth – Does this process have a Negative Carbon Footprint? One of the things that I would like to be noticed is the total energy must be used to extract the fuel vs. the energy it provides. An analysis of the cost would be nice too. An extreme comparison is to announce that one would start a company to bring fuel, hydrocarbons, from the Titan, the moon, but ignoring the costs with the energy to send things there, the costs, etc. The question is will Obama block its access with the EPA like he did with the oil in that reigon? See gas hydrates burn…Here is more on gas hydrates at USGS Gas Hydrates Lab in Menlo Park, Ca.